Yay! Thursday is here so we're more than halfway into this week, which means B will be home soon! I've missed my darling of course and so have the kids and we're all looking forward to the weekend when we can reunite as one big happy fluffy family again. Keeping myself distracted during B's absence is no easy feat so aside from work, I've been killing time blogging and immersing myself in the latest games at Online Casino Hero, which also offers a very detailed guide to online casinos as well as game rules and tips for the most popular casino games. The past few days saw me brushing up on my Blackjack skills online or glued to my favourite slots. I seriously think slots are the best casino games. I'm not into bingo or video poker and slots are fun and easy to play. The graphics are great and the prizes even cooler so really, what's not to like? All I have to do is click my mouse and hope to WIN! So blogging, working, cleaning, playing with my kitties and enjoying the casino games is what I've been doing lately to curb my boredom. Phoebe has been most faithful; following me around everywhere I go and keeping me company on my desk when I play my games. Any other ideas to keep me occupied for the next few nights until my darling comes home? GP!!! Pheebss!!!!! comelnya ko.. gerams!!! LJ!!!! Hehehhehe comelnya ko hahahahha, thanks LJ! Phoebe in manja mood now, rolling around on the floor, meow! Ha ha thanks Bill, def looking forward to the weekend yay! 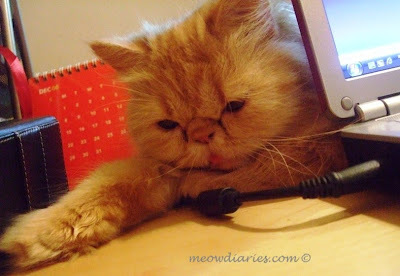 Meows working hard this month, helping Master make more ka-ching to buy B’s new phone he hehe! Yeah but still feels so long for me he he….hurry home B! This one is Phoebe lol! Meow meow! Recent blog:=- Is Social Media a Fad? Master, stop playing online games. Blackie pun suka duduk di belakang lappy kalau rizal buat kerja. sampai terpaksa shoooh shooh dia. Mungkin sedap kot haba panas keluar .. Agak sahaja.. He he okay Rizal, I pun risau gak tgk Pheebs dok belakang wayar but her fluffiness should protect her well he he!!! I think so too Rizal mmg haba panas keluar even tho pakai cooler still rasa panas kat belakang tu kan? Congrats to u too GG, chopping away like nobody’s business, meow! Weekend is here GG!! Ur exams over edi??? More tissue for sweet GG, hugs! Ohhhhhhh zzzzzzzz eh he he… morning GG, wakey wakey!